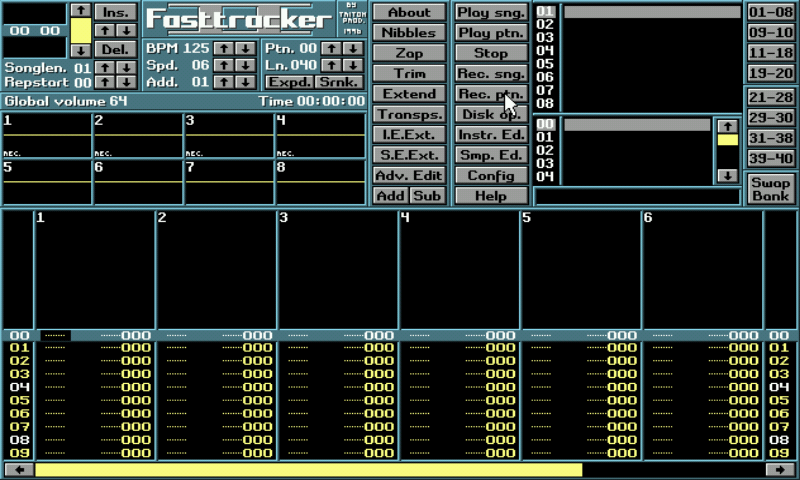 FastTracker 2 Clone by Olav Sorensen. 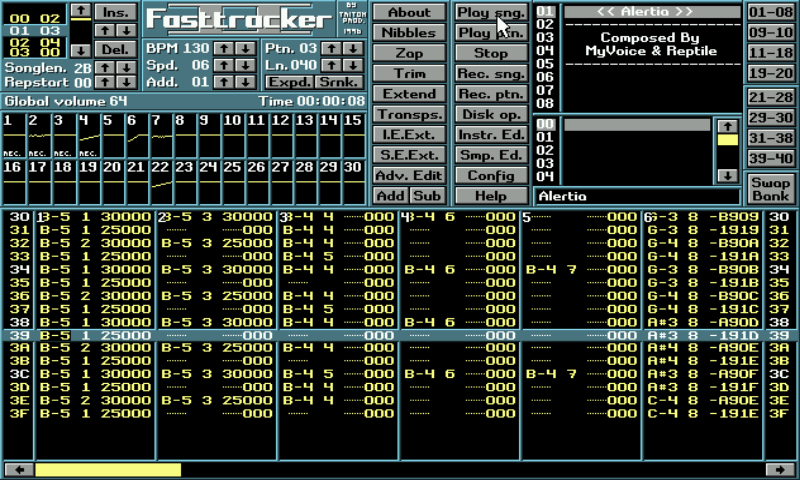 FastTracker 2 is a music tracker originally created by Fredrik "Mr. H" Huss and Magnus "Vogue" Hogdahl, this clone is partly based on the original FT2 source code for DOS (coded in Pascal and Assembler), but is re-implemented using C and SDL2 for more portability on modern platform. 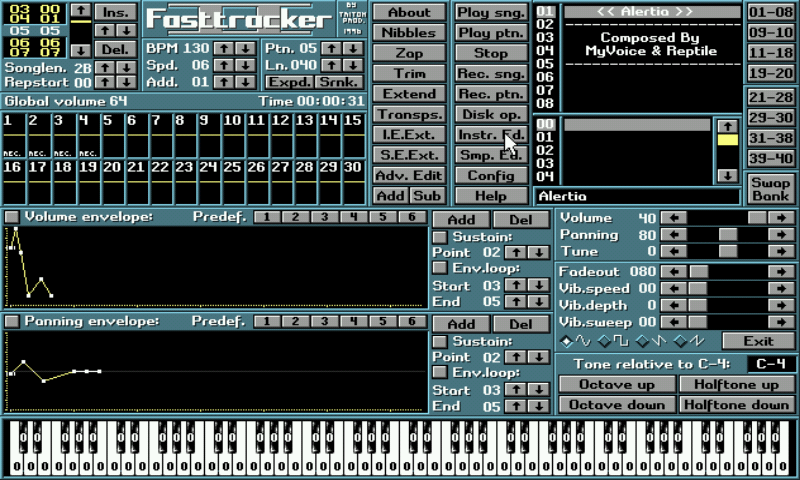 The FT2 interface is largely inspired by the looks of Amiga's Protracker. The screen consists of a pattern editor in the lower half, while the upper half features an instrument selector on the right, and the general module settings and some oscilloscopes. 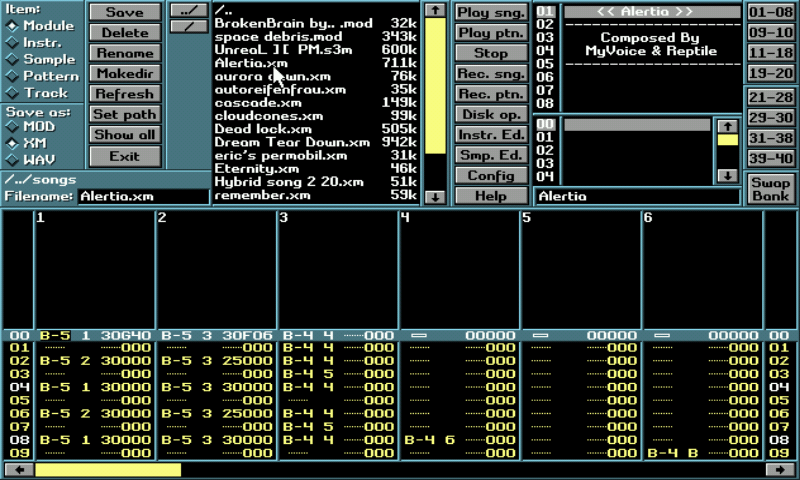 The pattern editor can be changed to sample and instrument editors screens. The program also features a little Nibbles clone and in-software documentation for all the features. Standard modules (15...31 instruments) (MOD,NST). Fasttracker v1.0 (2,4,6,8..32-channel formats) (MOD). SMP/SAM/RAW/SND data files, signed and unsigned. Pandora port run with the help of GL4ES library of ptitSeb. Beta 130: Audio channel mixer optimizations, Big code cleanup, Fixed some bugs. Some NEW songs added. Beta 119: Some mixer speedup, Support loading .MODs with odd channel numbers (1,3,5..31), Fixed crash when loading .STMs with empty patterns. Fixed some possible thread race condition issues on close, Various MIDI fixes. Beta 112: Scopes are now done with fixed-point arithmetics instead of floating-point. Some small security fixes. Code cleanup. Linear interpolation is now done with 16-bit fractional precision instead of 15-bit. Note Eb (in flat notes mode) was wrongly displayed as Db. Beta 108: update code with fixed playback counter by the author.